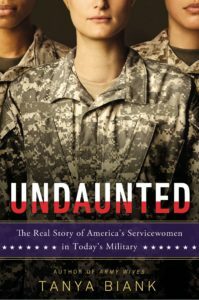 ON TWE RADIO APRIL 6, 7: In Undaunted–The Real Story of America’s Servicewomen (New American Library), Tanya Biank takes an inside look at women in today’s military–their professional and personal challenges from the combat zone to the home front. In this up close and personal account, Tanya investigates the true life stories of four trailblazing women who are each involved in the military in different ways. Tanya is the author of Army Wives–The Unwritten Code of Military Marriage, the basis for one of cable’s top-rated dramatic series. The author is a former newspaper reporter covering the military.